That is how one of the great unsung literary achievements of the last twenty years begins. I’m talking about the two paragraphs of text on the back of this 1991 Pat Perry card. It is, in my opinion, the pinnacle of its genre, a work that transforms the task of filling up the would-be blank space below a meager list of statistics into a comment on the space we all try and mostly fail to fill through all the days of our finite life. Through most of the history of the genre, which like intricate and ornate medieval book marginalia has been produced entirely in uncelebrated anonymity by nameless artisans, text was used to attempt to refute the vast void below the would-be blank space on the card. Below numbers that intimated transiency and futility, claims of importance were made, hopeful prospects voiced, brief miniscule highlights clung to. A fine utility player for Chisox the past 2 seasons, Bill hopes to see action as starter with Mariners in 1977. Brian’s first big-league Homer came after just 7 games in majors. Gary gained credit for Victory as Brewers defeated Indians, 17-4, on September 6, 1976. The hallmarks of the genre, including the use of clipped article-dropping syntax (as if the message was the body of an urgent telegram) and the heavy reliance on certain nouns signaled by the capitalization of those nouns (as if to elevate key words such as Victory and Homer to the realm of the sacred), produce a third common trait in back-of-the-card text: a faintly desperation-tinged voicing of the message that Everything Is OK.
Maybe everything is OK. Maybe one day we will all “see action as starter.” Maybe one day we will all have our lives transformed into a holy succession of Homers and Victories. Maybe one day we will all be redeemed. Pat, a soft-throwing southpaw middle reliever, has suffered a lot of baseball rejection in his 13-year career. He has been released three times and traded twice. Nine times he has played with at least two teams in one year. The lowest ebb of Pat’s fortunes came in ’83 when he was cut by Double-A Columbus (Astros) in June, signed by Double-A Buffalo (Indians) in July, cut 12 days later and finally signed by Class A Springfield (Cardinals) in August. 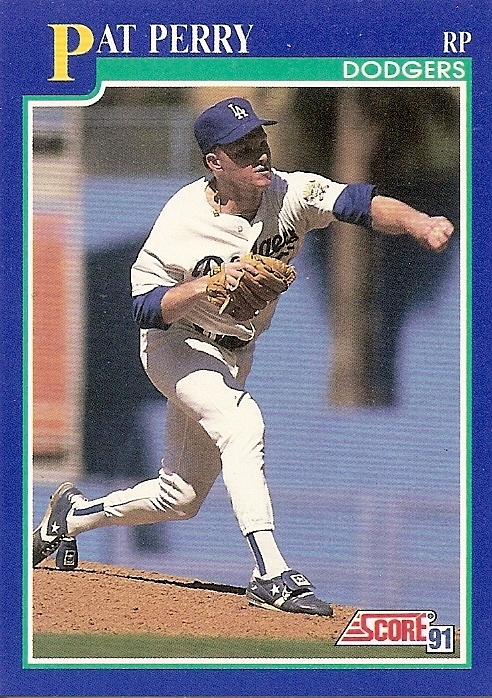 At any rate, Pat was signed as a free agent by the Dodgers in December ’89 after he was cut by the Cubs. Unhappily, he was on the disabled list the first two months of the season with a shoulder injury and was used sparingly after that. You are currently browsing the archives for the Pat Perry category.